(1) It is necessary to subject the patient to X-rays passing through the head (CAT), or to inject the patient with a radioactive substance (PET), which limits how often a scan can be performed. (2) The CAT scan only shows the shape, size and density of conditions in the brain. The PET scan only shows the intensity of activity in specific regions of the brain. While both are essential and beneficial in modern medicine, neither of them can reveal the causative factors of objects and events detected in the brain. In addition, both technologies are unable to provide information about what is happening in parts of the brain that have a normal appearance, or are inactive. While the complex and integrated areas of the brain are too close together to read without expensive hospital type equipment, and it is too dangerous to place electrical probes into each area of the brain to obtain frequency readings, nature has solved this problem for us. Since electrical impulses from the brain are transmitted and radiate throughout the central, autonomic and parasympathetic nervous system, each area of our body to which the nerves extend radiate the brain signals which originated in the corresponding connected area of the brain. As a result, the human body becomes a macrocosm for the small scale of the complex brain, and serves as an accessible magnified window into the intricacies of the brain. A detailed, full color Brain scan image, traces the bio-energies from 40 regions of the human electro-field, back through the connecting neurological systems, and into the medically correct corresponding regions and organs of the human Brain. 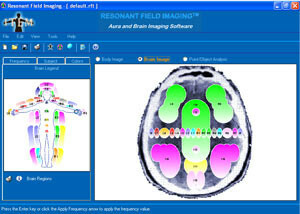 The “RFI™ scan” measures conditions and events in the brain indirectly, by first using the electrical field sensor to detect electromagnetic radiation originating in the brain, and then using a computer to compile the numerical data, and construct a visual image of the brain. (1) This form of Brain Imaging does not subject the patient to any radiation or unnatural substances which could have any side effects. Instead, it passively detects and analyses the electro-field bio-energies which naturally emanate from the Brain. As a result, these Brain scans can be conducted as often as desired. (2) This form of Brain Imaging reveals, identifies and analyses all bio-energies which are present in ALL major regions of the brain, regardless of whether they have a normal structure, and regardless of whether they are active or not. Therefore, RFI™ is able to give an enormous amount of information about structures of the brain which cannot be analyzed using the CAT or PET scans. (3) By identifying the bio-energies that are present in specific regions and organs of the brain, RFI™ gives a more complete picture of the events, situations and conditions in the brain. It reveals which parts of the brain are effecting each other through the exchange of energy-information, and reveals the primary function or role of each part of the brain in a system of physical or mental illness. In addition, it is able to reveal exactly how the brain is influencing health conditions, and how health conditions and the patient’s psychology are physically affecting the brain. These brain scans are a very interesting supplement to conventional medical technologies. To Schedule an Aura or Brain Imaging Session call (518) 383-9066.